This former Ben & Jerry's manager is a successful playwright! And a soon-to-be WEDDING OFFICIANT! Everyone congratulate Tommy! He's been waiting for this his whole life! It's his big day. Also congratulate his wife, Mara. She is his Mrs. Lovejoy. Not At Clay and Susan's Wedding! Erik and Charlotte are painters. They spend the wee hours at Lyndon St. Artworks. They have a dog named Sam and a cat named Luna. These are the official wedding plumbers, Walker Davidson and Jane Shaffer. 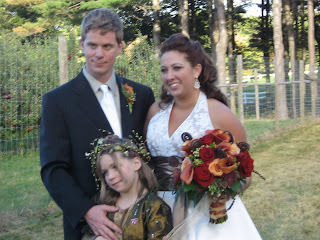 This picture comes from another wedding they plumbed; supposedly they do great work. They also run a catering business but be assured: they do the two things on separate days. And here is a picture of Susan and Clay at Clay's work shower. 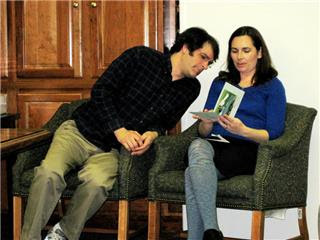 Notice how Clay is making the extra effort to lean over to read the card - a sure sign of a good husband according to Donna Perreault, Susan's co-worker and Associate Editor at The Southern Review.